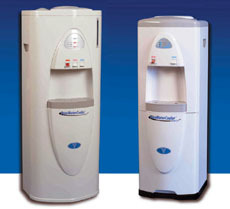 Vertex Water Products, of Montclair, Calif., introduces an expanded line of its point-of-use water coolers. Available in two temperatures (hot and cold) or three temperatures (hot, room and cold), the PureWaterCooler™ is rugged, handsomely designed and easy to clean. The reverse osmosis option makes clean water from city water, eliminating the need for storing and handling 5-gallon bottled water. The units feature tough ABS plastic and steel cabinet, no-drip faucets and easy access to filters through a removable front panel. A countertop model is also available and a UV option can be added to any cooler.